Grub worms are beetle larvae. The grub worms found in the lawns and gardens of North America are the larvae of billbugs and multifarious scarab beetle species. The adult beetles do little damage, but most grub worms are considered pests. Feeding on plant roots and crowns, grub worms can ruin your lawn, while birds, skunks and raccoons may dig up your infested turf in order to dine on the grub worms. White grub worms are the larvae of various scarab beetles, including June bugs, Japanese beetles, dung beetles and northern masked chafers. White with dark heads, they're soft-bodied and have six legs. Green June beetle larvae are the exception, they have no developed legs. White grubs reach up to 1 inch long, depending on their age and species. Most white grub worms live in the soil, eating your turf's roots. Some white grubs, like dung beetles, are not harmful. They live in feces or compost, converting cellulose into soil nutrients. The many scarab beetle types vary in color, size and shape. Some have horn-like protuberances. Japanese beetles are shiny green with copper-colored wing covers and have five white spots on each side. Masked chafers are chestnut brown. Their dark brown heads fade to light brown, giving them a masked look. 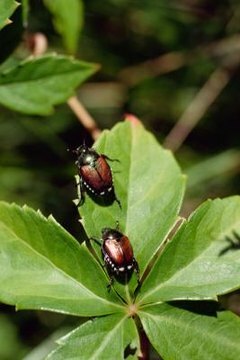 June beetles have a three-year life cycle, while other scarab beetles live for 12 months. Adult June beetles and Japanese beetles emerge in May or June. Billbug grub worms have curved white or cream bodies and brown heads. Legless, they can grow up to a half-inch long. Billbug grubs invade grass stems, feeding on the plant's crown. They're found in covered areas, under and around shrubs and bushes. As the grub eats the crown, the grass wilts, and small isolated patches of lawn die. Adult billbug beetles are often called snout bugs or weevils. They can be black, brown or gray, and they have long, tapered snouts. Their body length is just under a half-inch, and their wing covers are the same length as their thorax, head and snout. Adult billbug beetles cause only minor damage to grass, cutting tiny holes in the stems when inserting their eggs.